← 70. Tain. 25th Oct 2017. Take on the UK’s toughest par 3, “The Rockies”. Anstruther Golf Club sits on the Fife coast between the villages of Anstruther and Pittenweem about 9 miles south of St Andrews. It was established in 1890 with 7 holes with 2 further holes (the current 1st and 9th) added in 1892. Old Tom Morris advised the club in 1896 to extend the course, but it’s not clear whether he did any re-design. “The Rockies”, UK’s toughest par 3! 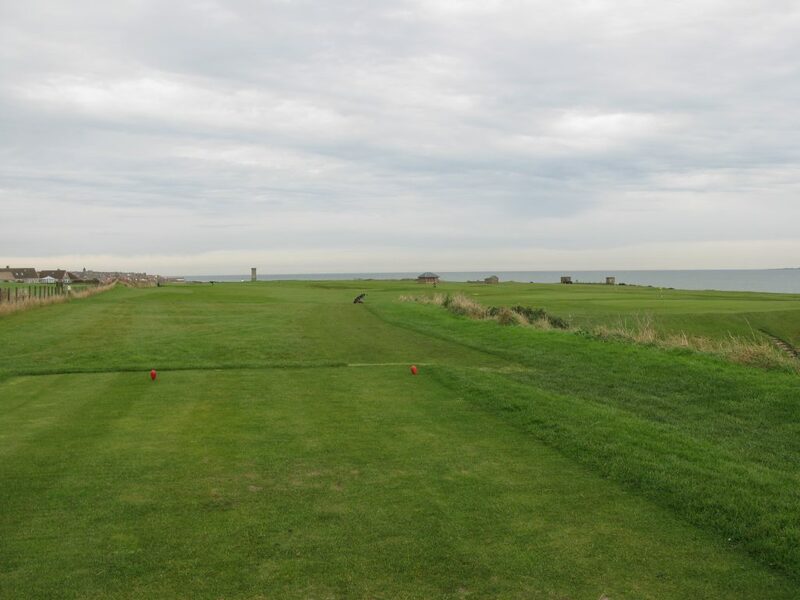 The course provides excellent views over Anstruther Harbour and out to the Isle of May, Bass rock and the North Berwick coastline. 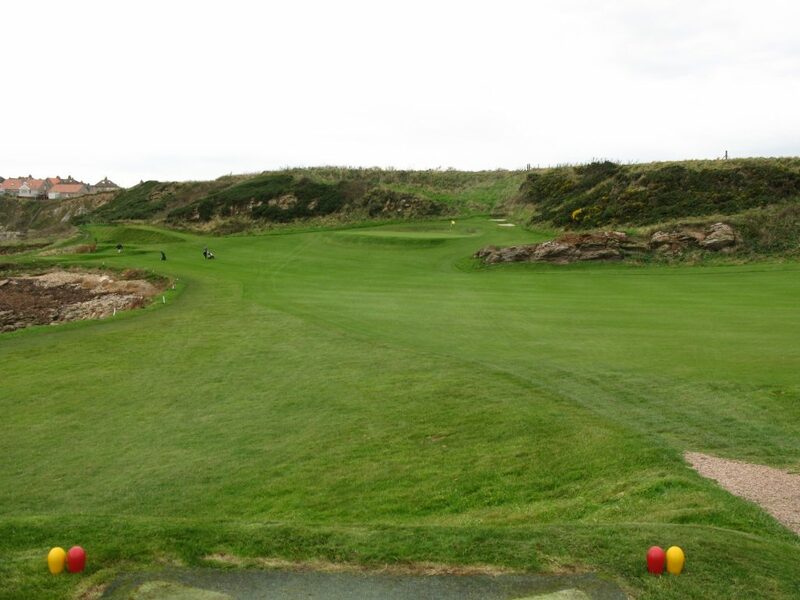 However, I would recommend playing this course solely to play the par 3 5th hole, which was voted in 2007 as the “toughest par 3 in the UK” by Todays Golfer magazine. 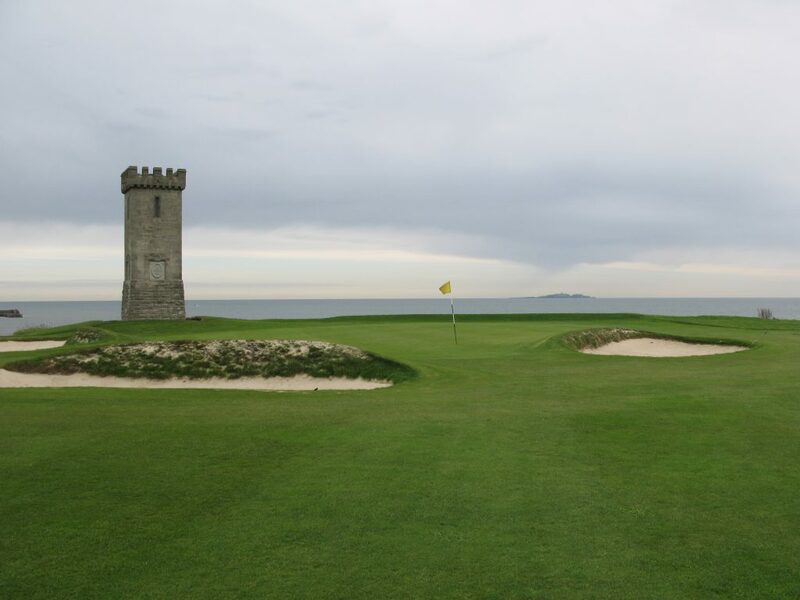 “The Rockies” is a coast hugging 245 yards into the prevailing wind, having a blind tee shot from an elevated position into a small green surrounded by a fairly steep cliff bank on one side, with the coastal rocks on the other. I imagine many a member has never parred this hole from the white medal tee, or even the main yellow tee at 237 yards. Cynics could conclude that it’s the hardest par 3, because it’s really a par 4! Disappointingly when I played the tees were placed about 40 yards forward from the bottom of the cliff side, completely altering the hole. Given that the Golf Club make such a big thing about the hole in there website advertising, they should always use the main tee area in my view. The nice looking par 3 6th hole at Anstruther. The 5th hole makes up a bit of an “Amen’s corner”, along with the par 3 6th and par 3 7th holes, but other than these holes the course is a little featureless to my eye, other than the 2nd hole which is a short par 3 played towards the coast and called “Monument” due to the adjacent WWI War memorial – a “baronial tower”. The WW1 “Baronial” War Memorial adjacent to the well guarded Par 3 2nd hole at Anstruther. One interesting quirk is that the course was closed during WW2, during which time the course was trenched and numerous poles erected to prevent the landing of enemy aircraft. There are also some small wartime gun placements and shell stores which are integral parts of the course. 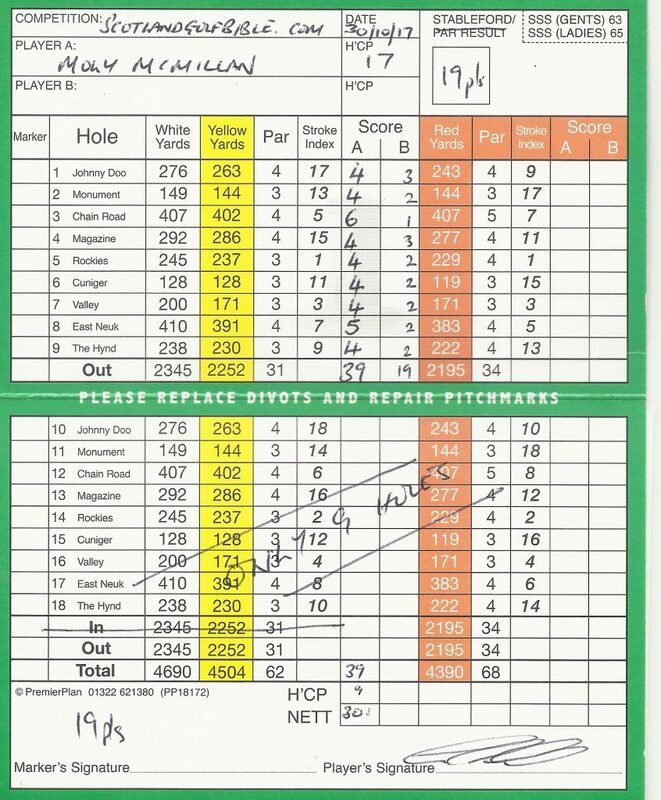 The course was in pretty good condition when I played and, along with the first light breeze I’d played in for a while, I shot 39, 8 over, and about exactly to handicap (17). Other than the magnificent par 3 5th, the clubhouse restaurant is apparently highly rated and given its delightful location is another reason to visit. This entry was posted in 1851 - 1900, 3 star, 3 star, 9 holes, Course Architech, Course Owned By, Course Quality, Course Type, Holes, Links, Members, Old Tom Morris, Overall Value, Price, Region, The Kingdom of Fife, When Course Established, £20 - £39. Bookmark the permalink.